Deadwood: Great show? or the GREATEST SHOW EVER? God, how I love this show. Everything about it is absolutely brilliant. The dialogue is a joy. I haven't heard such musical profanity in all my life. Every character is perfectly cast. I get a smile on my face every time Trixie, Jane or Al shows up. It's fascinating to watch the web of relationships among the different characters and how allegiances shift. The theme of community evolving from chaos is well represented and has a philosophical depth that surprises me. I'm finally coming to the end of season 3. I know the series is almost over and I'm sad to see it go. I hope it has a better ending than Carnivale at least. Damn you HBO. Here's to the greatest television show. 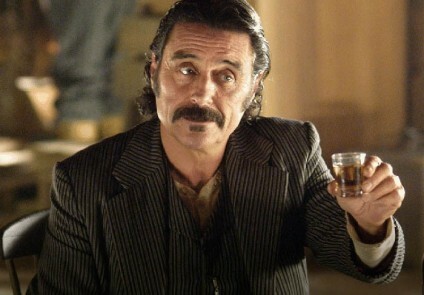 May there be more shows as good as Deadwood! Oh, there's plenty of good shows out there nowadays! My personal favorite now is 'Breaking Bad', which has me jumping out of my seat in shock. I definitely want to get into Breaking Bad at some point. I think the next big serial for me will be The Wire. This must be a Golden Age of TV. I think the DVD age has opened up the possibilities of TV drama in a way that sets it apart from other media. Cable channels like HBO, AMC etc., have also made it possible to make shows that don't need to play in Peoria, so finding the lowest common denominator is a lot less important. I have to warn you, Steve. If you watch more than two episodes of the Wire in one sitting, you'll be talking like a black kid from Baltimore for the next week. You feel me? I think, also, that TV producers have realized that they don't need to throw millions of dollars at a series to make it financially viable. Since good writing costs as much as bad writing, and DVD sales can recoup the investment that the studios put in their series, (Previously, a series would hope to hit a hundred episodes so it could qualify for syndication and start making money for the studio.) we're starting to see a real artistic potential for the medium opening up! Glad you got a chance to watch it. Been a while since I watched it myself, but it's hard to forget an actor like Ian McShane. I'd suggest you skip The Wire, and go for Rome instead. Oh, I've already seen Rome. Another great series that I wish were a lot longer. Didn't mom say she liked that one?